This game has seen many years go by and is yet loved by many. 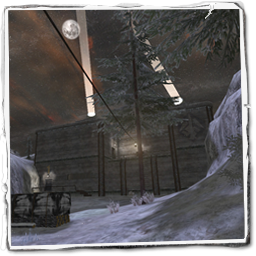 To properly honor this, the first map that has been overhauled as part of the ET: Legacy asset creation effort is "Frostbite, by Moonkey", who of course still deserves all the credit for the original level-design. This version is merely a visual overhaul of one of the most popular maps this game has ever seen. This is the fifth version of this map for ET: Legacy. * Fixed bug where team voice announcements for main entrance and side wall didn't get removed after objective completion. ---- Beginning: "Destroy the entrances" - "Defend the entrances"
---- First, main entrance is destroyed:	"Destroy the side wall" - "Defend the side wall"
---- First, side wall is destroyed: "Destroy the main entrance" - "Defend the main entrance"
* The player is now able to stop and revert Storage Wall movement by activating the button again. * Alarm now also sounds when the Service Door has been dynamited before the Storage Wall and Main Door.